The Fourth Industrial Revolution will be built within an inclusive culture, and it will start with technology. When more people around the world have more access to mobile phones than to electricity or water, it must mean that the digital revolution has already arrived. But the World Bank’s 2016 World Development Report says that it hasn’t dawned yet because the possibilities have not translated well to its supposed benefits. The spread of digital technologies over the last 20 years has been rapid and exciting, but the broader development benefits from using these technologies are lagging behind. Digital technologies can promote inclusion, efficiency, and innovation. When industries and organizations enhance access to digital technologies, it can accelerate growth, create more jobs, and deliver better public services in a country. According to the report, the benefits of rapid digital expansion have been skewed towards the wealthy, skilled, and influential around the world, who are better positioned to take advantage of new technologies. Although the number of internet users worldwide has more than tripled since 2005, four billion people still don’t have access. The Philippines alone is one of the fastest growing markets in terms of penetration (at 117%) for digital technologies with around 119 million mobile phone subscribers, yet our country has the sixth largest number of people who are not connected to the internet in Southeast Asia. Decision-makers and leaders will need to adapt and catch up, but what about those with less power and capabilities? To meet the promise of technological revolution means tapping into the innovative potential of everybody, regardless of gender, social status, and location. Klaus Schwab, Founder and Executive Chairman of the World Economic Forum, pointed out that there are four main effects of the Fourth Industrial Revolution on business: on customer expectations, on collaborative innovation, on product enhancement, and on organizational forms. The challenge now is in making technology more accessible and more inclusive so that nobody will get left behind. What can businesses do to thrive in the fourth industrial revolution? Game-changing innovations create new customer expectations. According to Trendwatching.com’s Feb-March 2016 Trend Briefing, watching businesses is the counter-intuitive secret to anticipate what people will do next, rather than watching customers. their customers are using now. When dating apps were gaining popularity in a region considered as having conservative cultural values, older generations were stumped. Startup founders became younger and they built businesses that could also target themselves as customers. Soon, dating apps were flourishing in different parts of Asia. Customers showed loyalty to apps launched abroad but because local startups understood their customer better, there was a shift in received value and reputation. Because most of these apps rely on the human need to connect, social networking platforms play a big role in shaping the customer’s expectation. A lot of the tech giants are turning into philanthropy because they realized that technology can also benefit advocacy. It can be overwhelming to find out that 100,000 of your intended customers are at risk of getting HIV, but because you know where to find them, it’s just a matter of meeting them where they already are and continue providing your service. Your company’s corporate strategy is often boxed in frameworks and written on hand-me-down templates. 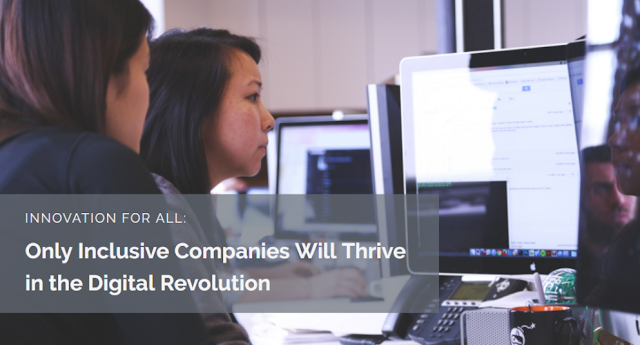 To thrive in the fourth industrial revolution, creative new business strategies must replace them with collaborative efforts between firms and within firms. It might involve developing long-term goals through design thinking, participating in people’s daily activities to gain local insight, or challenging textbook theories and old assumptions about how different generations view the world. Both young and old firms underappreciate the value of having relevant networks, but according to the 2015 World Economic Forum Report on Collaborative Innovation, these are important predictors of business success. Technology bridges the gap between the academe, national organizations, private companies, and government agencies because of its common language. When done correctly, innovation that is the work of partners will eventually and effectively work for others. The pioneers get recognition, but only the strongest survive. The challenge for businesses is in keeping their competitive advantage. In this generation, nothing is as original anymore and some say that’s a good thing, for as long as we emphasize the products of collective work and crowdsourced innovation. Improving on a technology that is already being used by 80% of our population might be considered disruptive, but when you want to solve the problem and ask why 20% is not using it, then the solution becomes more inclusive. Physical products and services can now be enhanced with digital capabilities that increase their value. One such example is the rise of the Internet of Things (IoT). Last June, Samsung hosted a forum in Washington, D.C. with government and industry leaders to discuss the future of IoT. In his opening remarks, Oh-Hyun Kwon, Vice Chairman and CEO at Samsung Electronics, emphasized that the conversation around the possibilities of IoT should shift its focus from smart homes, offices and factories, towards smart cities, smart nations and a smarter world. that improve the quality of life. IoT technologies are already influencing the way we live. But right now, they’re taking the shape of gadgets that are available only to the affluent. Businesses should consider improving accessibility to such products that can potentially improve the day-to-day quality of life for everyone, everywhere. In a Fortune 500 survey, companies provide data that the presence of women in the boardroom leads to better performance on various financial parameters like return on sales (ROS) and return on investment (ROI). WEF says it makes smart business sense to have a gender-balanced board, but there are still only 21 women in charge of Fourtune 500 companies in the United States. In a new survey by the Global Strategy Group and the Rockefeller Foundation, 1 in 4 of the Americans surveyed said that there are no women in leadership positions at their current workplaces. Organizations have long since existed to promote and empower women from all sectors. In fact, women are behind a lot of the innovations and successes of businesses that their male CEOs can confirm. Rick Goings, Chairman and CEO of Tupperware Brands Corporation, believes that a CEO’s best investment lies in hiring more women leaders. Recruiting and promoting women in the workforce is a very straightforward injection of skills that improves the company’s ethos and its business results. To have a more inclusive culture in the world of digital technologies, our leaders must concern themselves with the long-term objective of democratizing the fourth industrial revolution. The costs might be too high at the moment but all the symptoms are there for us to diagnose. It’s still more practical to replace a damaged engine than to keep fueling a worn-out one. The innovative potential of inclusivity cannot stay in sourcebooks and white papers anymore. It’s about time that more business leaders consider and act, especially if the only companies that will thrive in the next century are technology leaders that put inclusion in the forefront of their strategy. family and community, and society as a whole.